Blogs that are just filled with a bunch of text can be really boring to read. Make your blog posts more engaging with images that relate to what you’re writing about! There are a couple of places to get images that you can use for your blog posts and newsletters. 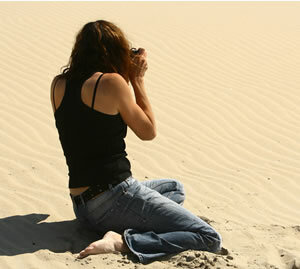 Take your own pictures – This is the cheapest and easiest way to get photos to use for your work. The down side is that you have to have a subject that relates to what you’re writing about. Buy Royalty Free stock photos – These are what you’d purchase from big stock photo sites such as istockphoto.com or www.dreamstime.com The benefit of these types of sites are that you can find very high quality images for almost any topic you’re writing about. Use Free stock photos – You can find a ton of Creative Commons licensed images online that you can use freely for your posts. Most times you just need to link back to the artist’s website or link where you “borrowed” the image from. Some sites that have a pretty good selection are: www.sxc.hu, www.freedigitalphotos.net & even Flikr.com (Just be sure you use the advance search feature and select the Creative Commons license button to find work you can share.) This can be a very inexpensive way to get images, however the selection is much more limited. Just remember it’s not right to “borrow'” any images you find on other people’s websites or in Google. Most of those images are copyrighted to the individual or others whom they’ve purchased rights to use the images. Just as you wouldn’t want people stealing your photos or work, please be extend the same respect to them. Your “To Do” item for the week If you have some posts that don’t already contain images, go to some of the sites listed above and download some to add to your posts. The next time you write, take about 5 min to find the perfect image to accompany your post.